This is a letter to the NSW Premier and Transport Ministor in support of the Cooks River GreenWay. It’s a cycling, walking and green corridor proposed to run along with light rail line from Dulwich Hill to Leichhardt. It would open up more cycling options for this area and provide an important link for cycling commuting between Tempe and Leichhardt and beyond to get more people on bikes and off these congested roads. BUT the state government in all its wisdom has deferred it “indefinitely” because it cites cost and logistics. Yet there’s always money for more roads and more car parking. To find out more about the GreenWay and how to help campaign go to the Friends of the GreenWay site. It also has an email to send your support. Dear Premier and Minister, It is appalling that the NSW Government has cut funding of the GreenWay shared pathway and bushland regeneration project in the state budget. I want to express my strong opposition to this reduction in the NSW Government’s commitment to active transport. The GreenWay is an essential, much wanted and anticipated community asset and is a foremost project in the strategic planning being done in NSW. The GreenWay will have many advantages including: – Maximising the patronage of the light rail, linking it with regional cycling and walking routes – Providing a regional active transport corridor for the growing (and ageing) local population – Protecting bandicoots an endangered species living in the corridor, and establishing a bush corridor though a highly urbanised part of Sydney – Getting people out of their cars and into sustainable transport, making Sydney a more sustainable city – Providing an opportunity for children to walk or cycle safely to school, with 23 schools within the GreenWay catchment area. The GreenWay is a once in a generation opportunity that we cannot afford to lose, supported throughout the community. Building the light rail extension alone means the GreenWay may never be built, and will be far more costly than building the original, integrated vision. I urge you to review your decision and reinstate the GreenWay and ensure all the work, both paid and volunteer, that has gone into the project so far over many years and the $1.8m NSW Environmental Trust Grant is not wasted. So come on, what’s really stopping you supporting the GreenWay? More electric bikes coming soon? Hot off the government press is this news that more electric bicycles will be coming into Australia. 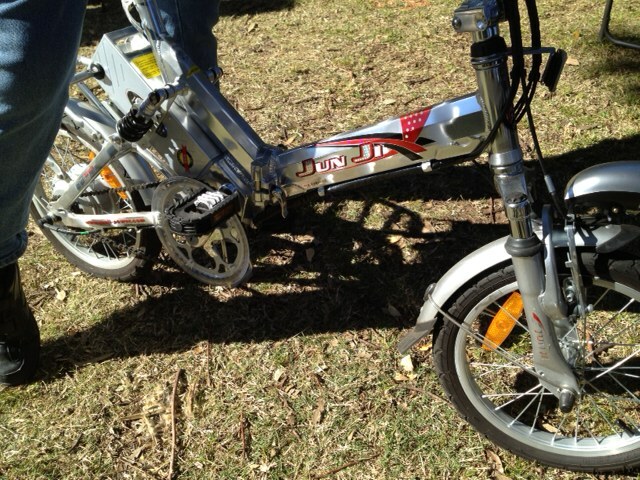 I just wrote about the Junji electric bike yesterday, so this is potentially good news to make it easier to get bikes like the Junji into the country and encourage longer commuter cycling. greater speeds than 25 km/h. performance and the strength of frames. Cycling Resource Centre – New Rules Give Cyclists a Boost Australia. via Cycling Resource Centre – New Rules Give Cyclists a Boost Australia. This post comes from the excellent Treehugger site. This is an excerpt. Find the full story, with cool pics, and lots of other interesting stuff at 6 Lame Excuses for Not Becoming a Bike Commuter (And How to Get Over Them). If any of these six excuses are holding you back from bike commuting, it’s time to get over it. 1. You’re carrying too much stuff. A chic messenger bag, a high-tech pannier, or just a classic basket can help you carry everything in style, and even leave room for you to stop on the way home and pick up those last-minute groceries. And if dropping the kids off at daycare is part of your daily routine, then bring them along on the bike: Invest in a carrier, and then unhook it and leave it at the daycare provider until you’re back to pick them up in the afternoon. They’ll be happy to skip the rush-hour traffic, too. 2. It’s raining (or hot, or humid). We know you don’t want to show up at work looking all bedraggled from a commute in wet weather, or from biking through humid city streets on the steamiest summer mornings. 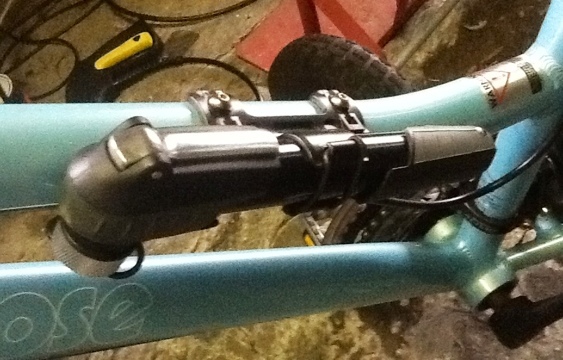 But this problem is easily fixed with a few simple adjustments: First, you need the right gear. Look for breathable, moisture-wicking fabrics that won’t leave you soaked (or smelly), and durable, waterproof jackets that will keep most of the water away (like Runshade shirts from Patagonia and the Lightbeam hoodie from Nau). It’s also a good idea to stash a change of clothes at your desk (or in your gym locker, if that’s nearby) for days when you didn’t check the weather before leaving the house — and toss in an extra stick of deodorant and a hairbrush for everyday use. While winter cycling brings up some of the same issues as wet- or hot-weather riding (like wearing something that you can change out of when you get to work so you don’t end up in those ice-crusted pants at your 9 a.m. meeting), it also offers challenges that are all its own. You need riding gear that’s warm but still breathable — check your local fitness store for cold-weather workout options — and a bike that can take on salty, icy, snowy streets (a mountain bike is often better than a road bike in these situations). 4. You don’t want helmet hair. No one wants to have helmet hair at work, but there are ways you can deal with it. There’s the $470 collar helmet from Hovding, which only inflates on impact, but you can also try a low-maintenance hairstyle; keep a stash of products at your office; or plan to hit the gym and shower after the commute but before going into work. 5. It takes too long. 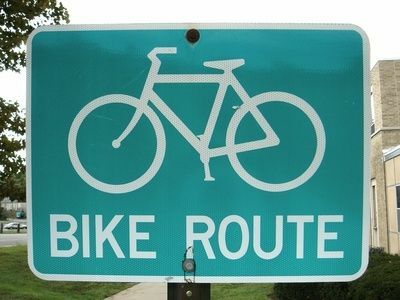 Depending on where you live (think bumper-to-bumper traffic, extra time needed to find a parking spot), cycling usually takes longer than driving. It may take longer than public transportation, too, but that depends on how close you live to the bus or train station and how reliable your city’s service is. The physical side of things also means you can cut down (or totally eliminate) your daily card sessions at the gym. Just imagine: Instead of going from a stuffy office to a boring treadmill, you could let the fresh air and sunshine rejuvenate your spirit. Doesn’t that sound a lot better? 6. You’re scared of traffic. Taking the proper safety precautions — like using signals and lights, riding in bike lanes, and following the traffic laws — lets drivers know where you are and what you’re doing, and that makes them able to give you the space you need to ride safely. This is also the kind of fear that only goes away with plenty of practice — so look over these 10 tips for cycling with traffic, study up on the rules of the road, buckle your helmet and get out there. You’ll be so glad to be no longer stuck in those morning traffic jams that you’ll be more confident in no time. I’ve got a gripe about pumps. Cyclists will know what I’m talking about when I say that you need to have a good pump. Use a bad pump and you’ll never quite get your tyres full of air. Slightly flat tyres will give you a bumpy ride and make cycling that much harder. I cycle to and from work with two panniers on the bike so flat tyres are particularly bad because the rear wheel will hit any bumps or grooves in the path very hard. This can obviously damage the rim but it makes for an unpleasant ride as well. I’ve recently just attached a compact pump to my bike as I found that my tyres would be a bit flat when I was about to ride home. It does a good job of pumping up the tyres if they’re very flat but once they’re nearly inflated it won’t quite fill them all the way up. It’s handy to have it at my fingertips when I need it but I nearly lost it on one ride when I didn’t secure it with the little rubber catch and I knocked it off when I was hopping on the bike. I didn’t notice until I was about to get back on and ride home and luckily it was right under my foot when I looked for it. I’ve had a couple of traditional pumps with the long barrel but they just don’t make them like they used to. They come loose very easily and the metal spiral falls out and the tube doesn’t hold in place so it’s easily lost. I’ve gone through three or four of these in the last year. When I was growing up, I used these types of pumps and they seemed to last forever but not so now. I actually reckon that lots of things made these days are of inferior quality and don’t last long. Cheap plastic, not metal and not well manufactured, they’re just not what they once were. If this pump fails, I might try a floor pump or ditch the pump all together. I often just stop in at the servo when the tyres need pumping up and grab the air pump and do it there. This high-pressure pump is the goods and it’ll fill the tyres so they’re hard and full. I can check the exact pressure in wheels and be sure they’re not over- or under-filled. How do you pump your tyres? Home pump or pump at the garage? 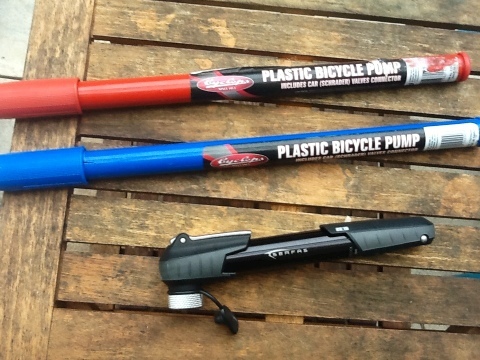 Old fashioned pump or new, compact-style pump? This is my new compact pump. The old school pump vs the fancy new pump. This comes from the Ride On blog and you can find it here: http://rideons.wordpress.com/2012/05/01/top-50-lights-for-commuting/. The 2012 top 50 is the result of testing 30 new lights and comparing these lights to those tested last year that are still currently available. Some of this year’s lights didn’t make the resulting top 50 list for this year because the lights of last year are superior. All results from this year and last were put through the same formulas, which are slightly different from last year. This explains why last year’s lights may have different scores this year. The important thing is that all lights are judged the same way. The increasing convenience of bike lights continues, with many of the new crop being USB rechargeable and mounted with easy-to-use silicone straps. Weight and size is also not an issue now, with technology so improved. The Best in test front light of this year at 36 grams is nearly a third of the weight of last year’s Best in test. Visibility has improved in the front lights without a corresponding hike in price. In fact, the Best in test this year is more visible and $20 cheaper than last year’s.